Lee began his long retreat from Gettysburg in the rain on 4 July and 5. By the time the 33rd had re-crossed the Potomac and moved into camp around Orange Court House, the regiment numbered only 90 men. With the death of Captain George Bedinger and the only Lieutenant, Patrick Maxwell, absent sick, Captain D. B. Huffman of Co. G, 33rd Virginia Infantry assumed temporary responsibility for the shattered Emerald Guard. Following Gettysburg, the 33rd Virginia Infantry continued to fight fiercely at Mine Run, the Wilderness and Spotsylvania, where the majority of the Brigade was overrun and captured. Those that weren't captured were re-brigaded and saw action at Monocacy, Cedar Creek, Fisher's Hill, Petersburg, and Saylor's Creek. 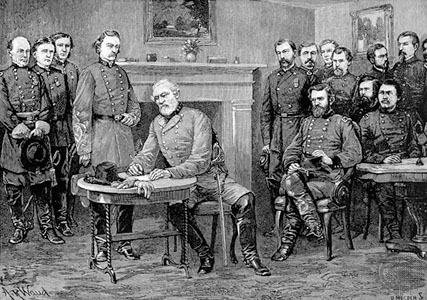 Finally, at Appomattox, there were only 14 men of the Emerald Brigade left to surrender.